Haccho Great Falls (八丁大滝, haccho otaki) is located in Kiwa, Mie Prefecture. It is 10m high. 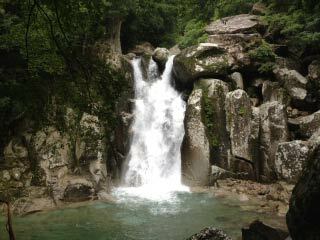 It is located near Nunobiki Falls and there are 3 other beautiful waterfalls. So, you can enjoy waterfalls tour around this area. Street is not in great condition. So, be careful when you drive. Drive 311 from Kuman down town. Make left to Hacho Valley. Be very careful because observatory was broken.